This coastal-inspired family home in Sydney’s Hills District – complete with a pool, outdoor entertaining area and tropical garden – was a dream that became reality after five years of planning. For Bonnie Hindmarsh, co-founder of Three Birds Renovations, creating her dream family home was a “once-in-a-lifetime” project that would inspire a relaxed outdoor lifestyle. “We bought this house five years ago, knowing that it needed a major renovation,” says Bonnie. “We wanted to build our forever home – the one where we can raise our four boys and not grow out of.” [CB1] For beach-loving Bonnie, this meant bringing a few key coastal style elements to the five-acre block in Sydney’s Hills District. Bonnie’s vision was for a ‘Modern Coastal Barn’ – creating a coastal lifestyle despite living 30km from the ocean. “My husband grew up on a farm in the Southern Highlands, I love the outdoors and with four boys it suited us to live on acreage,” says Bonnie. “So it’s really the perfect combo of coast and country for us.” The ‘modern’ element meant clean lines, fuss-free features and hardwearing materials. “This project really brings together all the inspiration and knowledge I’ve gained over the years,” says Bonnie. 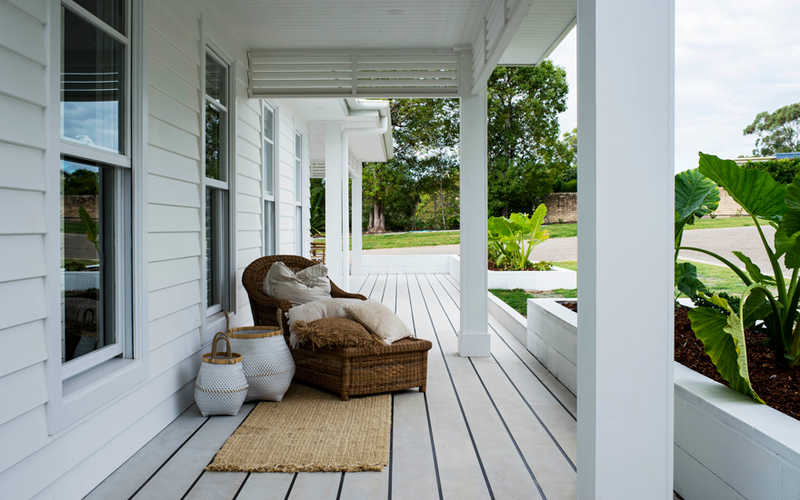 Her reno go-tos for a dream outdoor space included HardieDeck™ – “It shows up in every house we do!” – as well as plantation shutters, French doors and a servery to create a seamless indoor/outdoor transition. 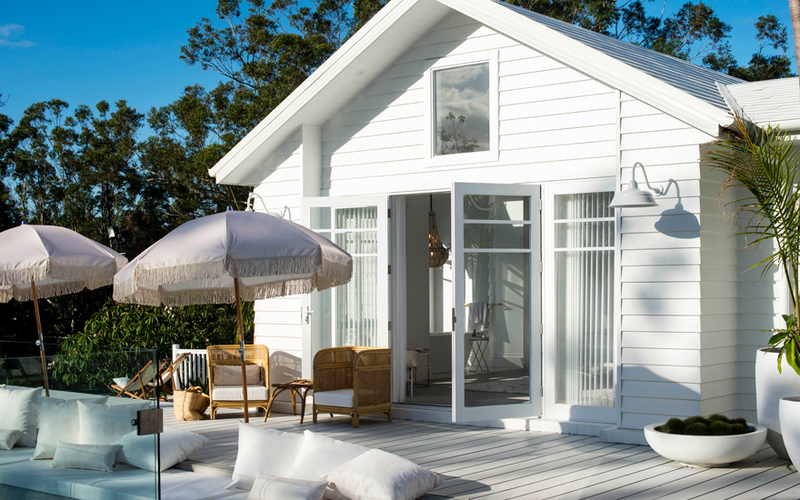 Bonnie's dream home brings together her love of the coastal and country style in a modern resort-inspired home. When designing her dream coastal home, an outdoor resort-inspired area was always going to be the top of mind for Bonnie, who wanted a home that made her feel like she was on holidays year-round. “We made the pool front and centre of the alfresco area, which is surrounded by HardieDeck,” she says. To one side of the pool Bonnie and the Three Birds created a sunken lounge area, filled with soft cushions that’s perfect for relaxing with a coffee or a cocktail while Bonnie watches her boys play in the pool. “We’ve also got an outdoor kitchen with plenty of seating at the island bench and dining table to feed the troops,” Bonnie says. Tucked away on the other side of the pool is a seated lounge area centred around an outdoor wood fire and hanging day bed, creating the perfect adults retreat for lazy summer days spent outdoors. Bonnie wanted her dream home to have a resort-inspired feel so she felt on holidays all year round! 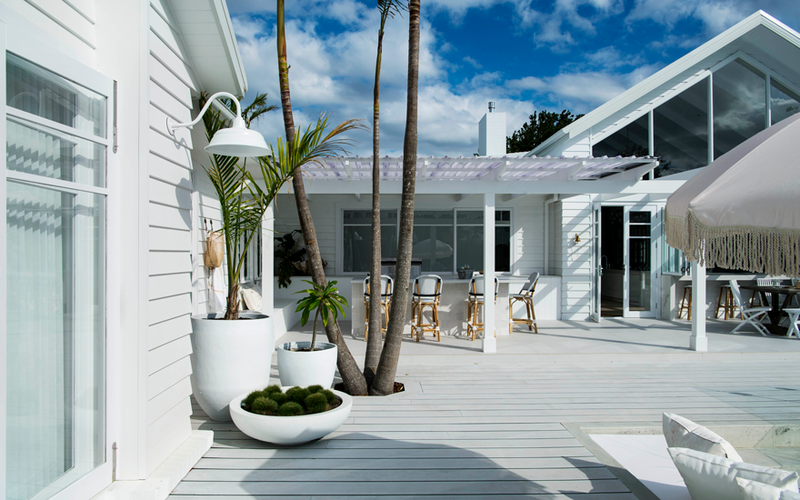 The garden was a big part of bringing Bonnie’s ‘modern coastal barn’ vision to life, a simple white palette providing the perfect backdrop for frangipanis and palm trees in the two internal courtyards. “These plants have always screamed coastal resort to me, so I knew I needed to be able to glimpse them from every window to feel like I’m on holiday at home,” she says. Bonnie chose to keep the raw colour of HardieDeck rather than paint it, using a durable clear sealer for a low maintenance finish.